Saturn is the sixth planet from our Sun. It is called the 'jewel of the solar system' because of its beautiful rings. It is the second largest planet in our solar system.Saturn is named for the Roman god of agriculture. This montage of images of the Saturnian system was prepared from an assemblage of images taken by the Voyager 1 spacecraft during its Saturn encounter in November 1980. This artist's view shows Dione in the forefront, Saturn rising behind, Tethys and Mimas fading in the distance to the right, Enceladus and Rhea off Saturn's rings to the left, and Titan in lts distant orbit at the top. 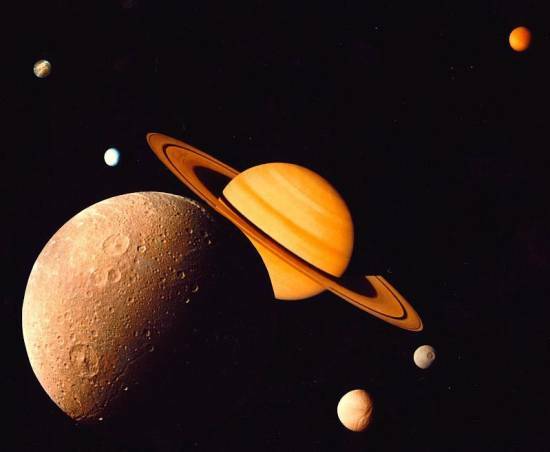 Saturn was the most distant of the five planets known to the ancients. In 1610, Italian astronomer Galileo Galilei was the first to gaze at Saturn through a telescope. To his surprise, he saw a pair of objects on either side of the planet. He sketched them as separate spheres and wrote that Saturn appeared to be triple-bodied. Continuing his observations over the next few years, Galileo drew the lateral bodies as arms or handles attached to Saturn. 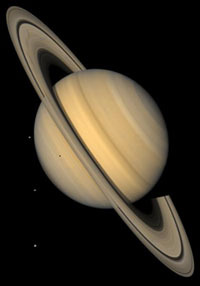 In 1659, Dutch astronomer Christiaan Huygens, using a more powerful telescope than Galileo's, proposed that Saturn was surrounded by a thin, flat ring. In 1675, Italian-born astronomer Jean-Dominique Cassini discovered a 'division' between what are now called the A and B rings. It is now known that the gravitational influence of Saturn's moon Mimas is responsible for the Cassini Division, which is 4,800 kilometers (3,000 miles) wide. Like Jupiter, Saturn is made mostly of hydrogen and helium. Its volume is 755 times greater than that of Earth. Winds in the upper atmosphere reach 500 meters (1,600 feet) per second in the equatorial region. (In contrast, the strongest hurricane-force winds on Earth top out at about 110 meters, or 360 feet, per second.) These super-fast winds, combined with heat rising from within the planet's interior, cause the yellow and gold bands visible in the atmosphere. Saturn's ring system is the most extensive and complex in the so-lar system, extending hundreds of thousands of kilometers from the planet. 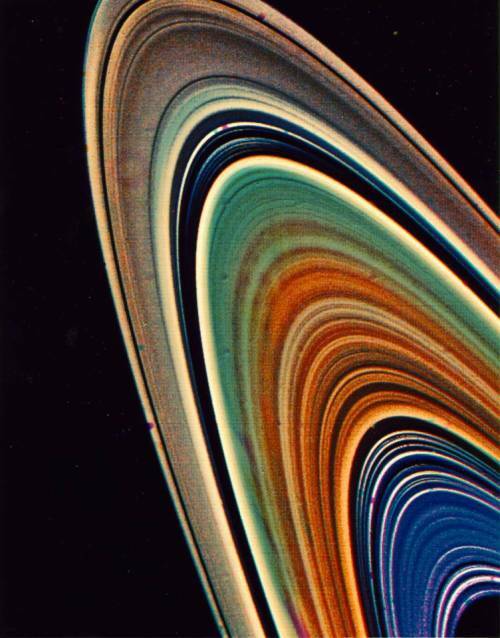 In the early 1980s, NASA's two Voyager spacecraft revealed that Saturn's rings are made mostly of water ice, and they found 'braided' rings, ringlets, and 'spokes' - dark features in the rings that circle the planet at different rates from that of the surrounding ring material. Material in the rings ranges in size from a few micrometers to several tens of meters. Two of Saturn's small moons orbit within gaps in the main rings. Possible variations in chemical composition from one part of Saturn's ring system to another are visible in this Voyager 2 picture as subtle color variations that can be recorded with special computer-processing techniques. This highly enhanced color view was assembled from clear, orange and ultraviolet frames obtained Aug. 17 from a distance of 8.9 million kilometers (5.5 million miles). In addition to the previously known blue color of the C-ring and the Cassini Division, the picture shows additional color differences between the inner B-ring and and outer region (where the spokes form) and between these and the A-ring. Saturn has 56 known natural satellites (moons) and there are probably many more waiting to be discovered. Saturn's largest satellite, Titan, is a bit bigger than the planet Mercury. (Titan is the second-largest moon in the solar system; only Jupiter's moon Ganymede is bigger.) Titan is shrouded in a thick, nitrogen-rich atmosphere that might be similar to what Earth's was like long ago. Further study of this moon promises to reveal much about planetary formation and, perhaps, about the early days of Earth. Saturn also has many smaller 'icy' satellites. From Enceladus, which shows evidence of recent (and ongoing) surface changes, to Iapetus, with one hemisphere darker than asphalt and the other as bright as snow, each of Saturn's satellites is unique. Though Saturn's magnetic field is not as huge as Jupiter's, it is still 578 times as powerful as Earth's. Saturn, the rings, and many of the satellites lie totally within Saturn's enormous magnetosphere, the region of space in which the behavior of electrically charged particles is influenced more by Saturn's magnetic field than by the solar wind. Hubble Space Telescope images show that Saturn's polar regions have aurorae similar to Earth's. Aurorae occur when charged particles spiral into a planet's atmosphere along magnetic field lines. Voyagers 1 and 2 flew by and photographed Saturn in 1981. The next chapter in our knowledge of Saturn is underway, as the Cassini- Huygens spacecraft continues its exploration of the Saturn system. The Huygens probe descended through Titan's atmosphere in January 2005, collecting data on the atmosphere and surface. Cassini will orbit Saturn more than 70 times during a four-year study of the planet and its moons, rings, and magnetosphere. Cassini-Huygens is sponsored by NASA, the European Space Agency, and the Italian Space Agency. By Comparison: If you weigh 100 pounds on Earth, you would weigh 90 pounds on Saturn (at the equator). *Derived from a 1 bar radius of 60,268 km. By Comparison: Escape velocity of Earth is 25,022 mph. By Comparison: Earth's atmosphere consists mostly of N2 and O2.